Sometimes you never see it coming. You’re in the middle of talking, you’re having a bad day, or you’re anxious and someone says a few words that slap you across the face. Your blood begins to boil, your heart rate increases, or you realize you’re being severely misunderstood. We’re all triggered by different statements and words more than others. In general, everyone hates hearing “calm down”, “relax”, or “you’re being too sensitive”. When I spoke with members of each personality type, across the board everyone hated those statements. Nobody wants to feel like they’re being irrational, regardless of their thinking or feeling preference. But what especially triggers the deep-thinking, analytical INTPs? Let’s take a look. If an INTP is questioning something or skeptical about a decision or rule they won’t rest until they’ve determined whether that rule or decision is rational. INTPs are natural skeptics and innovators, and are rarely happy with accepting anything as “just” the way it is. INTPs don’t have an innate respect for authority. Respect must be earned, not automatically given based on rank or position. Telling an INTP “because I said so” is a sure way to invite dissent and bitterness. 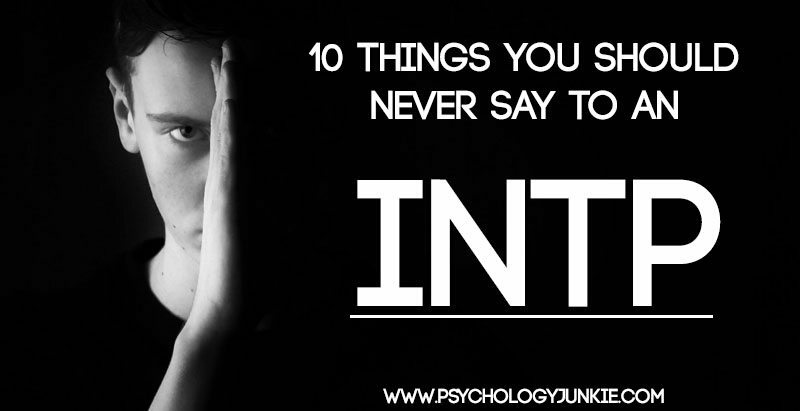 Unless INTPs are engaged in a stimulating theoretical conversation they are rarely chatterboxes. They are analytical and keep many of their judgments and thoughts internalized. Being criticized or pestered into talking is a sure way to make them feel uncomfortable or irritated. Celebrity gossip holds little to no interest for INTPs. People who spread rumors and share the details of other people’s lives tend to invite distrust from the INTP. They may be wary of forming relationships or friendships with these people. INTPs aren’t quick to express yes or no judgments. They share their perceptions through Extraverted Intuition (Ne), but keep their judgments internalized. Telling them to oversimplify or leave out pertinent information is asking them to repress a natural part of their personality. It’s also just plain rude. INTPs despise being rushed into anything. They like to have time to explore their options and analyze situations fully. Being rushed into a decision, especially a long-term decision, can cause them a great deal of stress. If you see an INTP reading, it’s best be as quiet as possible and leave them to their book. Interrupting them for any reason, even if it’s a friendly question about said book, will frustrate them. INTPs aren’t especially concerned with superficial details in their environment. They’re more likely to be thinking about bigger-picture issues than whether or not someone got a haircut/lost weight/is wearing a new outfit. INTPs enjoy having harmonious environments, but they don’t enjoy discussing their feelings unless they are really close to someone and instigate the conversation themselves. Being forced to talk about their feelings makes the INTP rely on their inferior Extraverted Feeling (Fe) function, which in turn can cause stress and discomfort. Asking any introvert to get out of their head is tantamount to asking a fish to breathe air. The nature of introversion is that you prefer the world “in your head” to the outer world. Any statements you’d like to add? Share your thoughts with other readers in the comments! More Articles You Might Enjoy! When I read “Yes or no, don’t explain “or “just decide ” I felt like I’ve been slapped, this is so true…. I’m not implying that the others are false they are actually true. These really are very accurate. As a kid, my mom would get on to me multiple times a day for scowling or glaring when I was literally just sitting there minding my own business. It was just my resting face. It’s something that always made me feel self conscious in public because I don’t look like I’m enjoying myself in candid photos, and when my friends are visible over the moon, I can’t pretend to show that much excitement. I also used to display a lot of antisocial behavior, preferring to read at recess (while hiding under something because my teachers would not allow me to do so). I still do hate large (or small….) gatherings. Zoning out has become a major problem for me, as well. I never paid attention in school because I had no need to. I had a 4.0 until after my associates degree in engineering. Now that the classes are challenging, I need to pay attention, but I can’t focus in class long enough to take anything from it. Especially given I’ve already had four thermodynamics related classes and am currently in two more. Why do you challenge everything I tell you? Why can’t you be like her or those girls? If everyone else does things in this way why don’t you? You have no emotions so you dont care about anyone in this family. What has she done now? Many more i guess i am al optimist with experience pessimistic thrills of being a female intp ! !